AC Repair may no longer be an option... now what? Repairing your old Air Conditioning system may end up costing you more than replacing it with a newer more energy efficient model. Here's the reason... It's the Refrigerant! Because of concerns for the environment, the EPA has mandated the phase out of R-22, the refrigerant which has been utilized in most older HVAC systems. New production and importation of R-22 will be completely phased out by 2020 due to concerns for its effect on the ozone. This phase out has lead to a reduction in the availability of R-22 (Freon) and a subsequential increase in prices for R-22 for the homeowner who is looking to extend the life of his leaking AC system by recharging it. 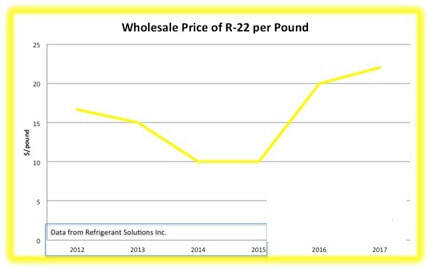 As supplies continue to decrease you can expect the price of available R-22 to increase significantly. At some point soon this will make replacing your HVAC system the cost effective choice. R-22 is currently being replaced by R-410A. But due to the molecular properties of this new refrigerant R-410A will not work in older AC systems or in heat pumps which were designed to utilize R-22. If you still have an HVAC unit or heat pump manufactured before 2010 you will most likely have to rely on R-22 if you need to recharge your air conditioning system due to a coolant leak or other major repair. 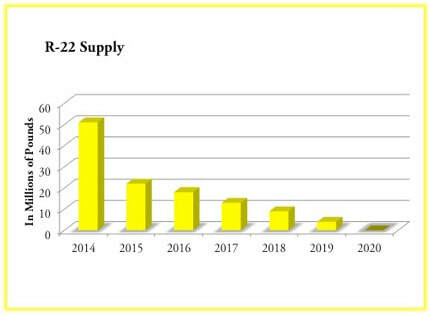 As dictated by the laws of supply and demand you can see that as we approach 2020 the higher R-22 prices will go. It is likely that at some point it will not only be more prudent to replace your system but will become more cost effective to have a new HVAC system installed. After 2020, you may not have a choice anyway. A new HVAC unit will end up saving you money on your electric bill. Earlier R-22 units are most likely 10 SEER units. The new units currently mandated by the government must be at least 14 SEER in the South. Thus new HVAC system should be almost 30% more efficient than your old one.